After spending a week in Amsterdam – including that touristy classic, a stay on a houseboat – I was actually pleased that bad weather in the U.S.delayed my flight home. 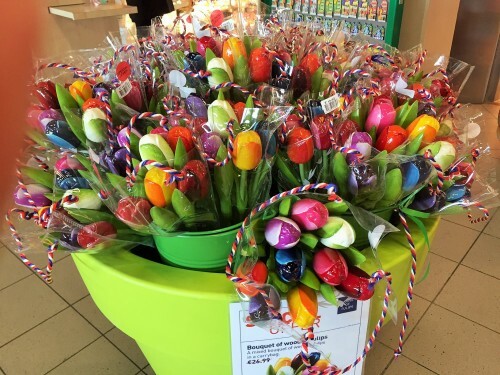 Because that gave me more time to hang out in Schiphol Airport, where I was really temped to buy these (somewhat corny, I know….) souvenirs. The ginger cake would have been a nice gift for my neighbor (I bought her a tote bag from the Cat Cabinet – shh, don’t tell her..) and those wooden tulips – spotted for sale everywhere in Amsterdam that by the end of week I was tired of them – would have been a long-lasting spot of color in the gray Seattle winter I’ve returned to. I know… just another reason to go back. Soon. Today is Souvenir Sunday – the day StuckAtTheAirport.com takes a look at some of the inexpensive, offbeat and/or locally-themed items you might actually want to purchase when you’re stuck at the airport. This week’s treat comes from Amsterdam’s Schiphol Airport, where I did a bit of cheese tasting at the ‘Say Cheese’ shop and found a cheese grater that doubles as a souvenir windmill. Share your finds: if you spot a cool souvenir at an airport that’s inexpensive, a bit quirky and “of” the city or region, please snap a photo and send it along to StuckatTheAirport.com. If your item is featured on Souvenir Sunday, we’ll send you a fun travel-themed gift.